You’re probably familiar with Google Analytics Enhanced Ecommerce, but it shouldn’t be the only tool that you’re using for eCommerce analytics. From A/B testing to heat maps, there are many other valuable tools that can help you optimize the customer journey and increase your conversion rates. In this article, we will look at how you can get more out of your eCommerce analytics with these kinds of tools. You have probably heard of A/B testing—or maybe even tried your hand at it—but it can be challenging to implement. For example, what elements should you be changing and when is an outcome statistically significant? There are some platforms that automate these insights but they can be expensive. Google Optimize makes it easy to execute successful A/B tests—and it’s free! It even integrates with your existing Google Analytics Enhanced Ecommerce setup! A/B tests enable you to compare two or more variations of the same page. Multivariate tests enable you to test variants with two or more different sections. Redirect tests enable you to redirect test pages to an alternate page. Redirect tests are the easiest way to get started. You simply define the original page and variants where you’d like to redirect visitors. For example, you might target a product detail view and redirect visitors to different variants to see if a different version improves conversion rates. After setting up the variants, you will receive a code snippet to install on your site to redirect visitors and collect data. You can then set the experiment objective by integrating with your Google Analytics Enhanced Ecommerce account. For example, you can track things like “transactions” or “revenue” based on your goals. Once the experiment is set up, the “Reporting” tab will tally the results of the experiment. The results will automatically be analyzed to see if any variant was statistically better than the original, and you can easily make informed decisions. Download our checklist of best practices for A/B testing eCommerce websites. You may also want rapid feedback when setting up new tracking solutions. For example, you might want to confirm that a tag is being loaded or ensure that the correct data is being sent. Manually checking these things by making transactions and checking third-party provider websites can be extremely time consuming for developers. 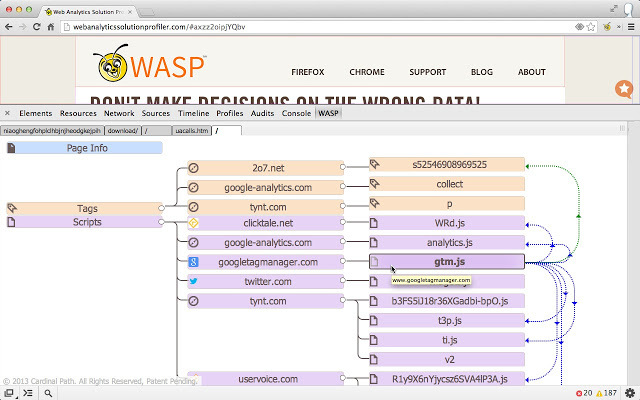 The WASP.inspector Google Chrome extension is designed to help you audit, validate, and debug the data sent from your website via these tags and beacons. With a visual interface, you can quickly see the relationship between tags and what data is being sent to eliminate unnecessary code and easily troubleshoot problems. After installing the plugin, you can access the dashboard by pressing Control-Shift-i on Windows or Linux or Command-Option-i on Mac to enter the Chrome Developer Tools, and then selecting the WASP panel. The WASP plugin will automatically detect all of the tags on the pages you visit and provide you with the information you need to audit and debug your trackers. It’s generally a good idea to keep external scripts to a minimum since it can reduce page load time. In addition, eCommerce shops located or selling within the European Union may be subject to GDPR regulations that require the disclosure of tracking services. WASP is a great tool to help meet these goals without spending an exorbitant amount of time and money. Suppose that you spend months redesigning your eCommerce website with a fresh, modern look. After the launch, you expect to see higher conversion rates, but the opposite happens. There’s a sharp drop in conversion rates. You could revert to the old design, but there’s a high sunk cost. You’d rather find the problem quickly and address it head on. Don’t forget to download our checklist of best practices for A/B testing eCommerce websites. Hotjar is designed to solve these problems by enabling you to examine user interactions through heat maps and visitor recordings. Heatmaps enable you to see where visitors are focusing based on where the cursor is hovering or where clicks occur, while visitor recordings actually record visitor activity for you to replay. Let’s say that you have found that some visitors are having problems logging into their account. Using visitor recordings, you might replay sessions where visitors are experiencing problems and see that they relate to a specific browser or element. Aside from troubleshooting, Hotjar enables you to learn how visitors are browsing your website. You can see some of this data with Google Analytics, but heatmaps provide a much more granular look at where visitors are actually looking rather than just where they are clicking. For example, you can see what sections or categories draw the most attention. This can help inform design decisions that can impact your bottom line. Many eCommerce websites utilize advanced site search technology, featuring things like native language processing, autocomplete, or filtering, to help their customers find the products they’re looking for. 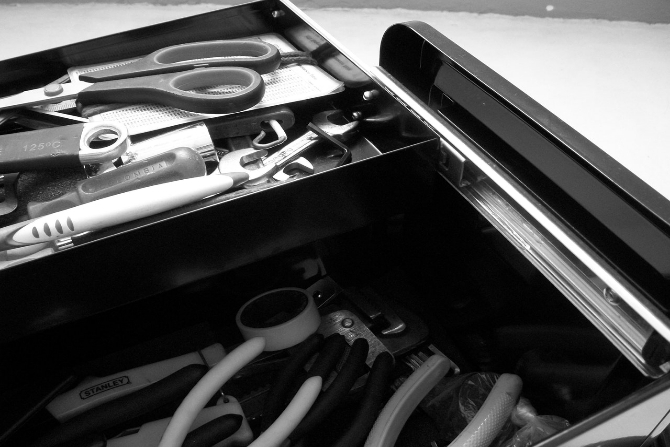 More rare, however, are tools that help optimize the customer experience on category pages. Given that site search typically only accounts for about 5% of sessions on an eCommerce website, the optimization of your category pages can make a massive difference in sales. Fortunately, Avatria Convert is designed to help you do just that. Using your site’s traffic data and machine learning technology, Convert is able to intelligently figure out what your customers are looking for, and reorganizes your category lists to put the most relevant products at the top of the page. When customers are better able to find what they want, purchases goes up. Best of all, it’s super easy to get started. Our one-time setup process takes less than ten minutes by interfacing with your existing Google Analytics account. You can then easily integrate with your eCommerce platform and search engines so that your site updates automatically. In an A/B test we ran for one of our customers, we found that implementing Avatria Convert helped improve conversion rates by 40 percent, increased per-session value by 56 percent, and helped revenue jump about 70 percent. Start a 30-day free trial to see the difference Convert can make on your website. Download our free checklist of strategies to get the most out of your A/B tests.